Step right up and gaze upon the amazing feats of writers: 99 word stories from birth and reconciliation to phonetic and Freudian slips. If there was one thing Buffalo Bill Cody was known for, that was a show demonstrating amazing feats of riders. Here we celebrate the written literary accomplishments of the Rough Writers & Friends. The rapids appeared along the side of the road, sidling swift and headlong into my consciousness. What had I expected: the Falls with no river? An hour earlier you sobbed in my arms. The world can be dark at twenty-four, but why bludgeon yourself with your mistakes? In the visitor center we read of Annie Taylor, who, in 1901, at sixty-three years of age, plunged over the Horseshoe Falls in a mattress-lined barrel clutching a heart-shaped pillow. She lived but failed to wreak material success. You see my sweet, it’s not the spectacle but the living that’s the feat. I will never know Elsie Maxwell (save for thee age with the only available thoughts to surely think we would last 1000 years – that Elsie reached, before she was there). The skull arrived on the wedding day, all through the ceremony he thought about it. Was it a primitive human? was it an ape? All agreed it was incredibly old and that more of the skeleton had to be found. In the quarry where it had been discovered, the manager pointed out the blocked cave and the search began. After several weeks fragments of bone were discovered, the palaeontologist was ecstatic. “What is it?” the manager asked, looking at the tiny scraps of bone. And that, oh best beloved was, more or less, how Australopithecus, mankind’s most primitive ancestor, was discovered. Still more pushing? Jean had no more to give. Fourteen hours of labor, pushing for two. No baby. Shift change. New nurse-midwife. New point of view. “OK. When you feel the contraction, push here.” The midwife, Mary Jo, put her hand on the place. A new wave came. “Yes! Here!” Mary Jo cheered her on. Next contraction, the midwife was in the bed, Jean’s foot on her ribcage to widen the pelvis. “I can feel the head.” She grabbed Jean’s hand to touch the wet lump emerging. Then the whole, crying baby. “What’s ya doin’?” John ruffled his grandson’s head. “I’m doing feats.” Jason barely glanced up from his game. Memories flooded back; that hand pulling him down, those knuckles swelling his lip. He nodded. Paul looked up. Genuine concern looked back. Anxious too. An hour later they still talked. Amazing, they said, how Jerry’s death had brought some closure. Mary was cutting her dog’s hair in the yard when an old blue pickup truck turned into the driveway below and started up the hill. She frowned. Who was this? “Go inside, please,” she called to her son, who was playing nearby. As the truck crunched up the gravel drive, she gasped. Surely it couldn’t be him, after all these years. How long had it been? The truck stopped and her father got out. Mary stared confusedly at his white hair, his trembling hands. Edna complied, looking at her card without showing Ed. As instructed, she slid it face down toward him. Ed reinserted Edna’s card into the deck and reshuffled several times while spouting some nonsensical words. He spread the deck on the table, closed his eyes, selected one card and showed it. would need at least two sharpshooters. And quickly. Aggie Runacre was still at the Taylors. Dobbs and Merle looked at her. She had their attention. “I have my late brother’s Spencer Repeating rifle, Mr. Dobbs…and I’ve been known to shoot a snake or two. Her hands were bound behind her back. Yet, Ellen managed to tear her wrists loose of the rope that bound them. Her hands started to bleed as they scraped against the prickly twine. She had only seconds to untie her ankles and scurry toward the door before he came back. Her hands were shaking uncontrollably. He grabbed her on her walk home after class. No one would know she was gone for hours. Would she even be alive that long? She shook her head, knowing it was too much to think about right now, escaping, that was her goal. A road trip for a writer is akin to soil to a gardener, it’s foundational. We recently drove from Wisconsin to Oregon. The beauty of the mountains is unmatched. The land is breathtaking. The amazing feat is God’s awesome design. But true to American irony, we saw her shadow side. In the middle of our trip we faced racism in Bozeman, Montana. Our truck broke down and we were refused service by local businesses. The truck is still in Montana three weeks later. It’s curious how race creeps through every crevice of this nation, right through the Mountains. What took you guys so long? You never listen to me. I told you to stay away from the wide open slopes. All the predators can see you. The gooseberry bush next door is the best way to travel. Takes a little longer navigating the spikes and thorns, but hey, it gets you up here without the worry of your life ending. Up here in God’s country. Where the sun shines and the nectar percolates from beneath the budding petals. The trip is gruelling, but so worth it when you make it to the top. Ant heaven. Peony buds. could eat everyday as well as provided with a roosting stick. unfold…And then to set it free. Phone clamped to my ear, I throw clean underwear into a bag. I hate to miss her birthday, but Gill will understand. Grabbing my toothbrush, I blurt out what I know. The idiot’s done it again. I’ve got to go. There’s no-one else. Silence at the other end. Why doesn’t she speak? “The idiot?” A man’s voice? Offended. How could I call him instead of Gill? But I did. “We need to talk about this.” Time he got some proper help. Stopped relying on me. Jane almost drops her phone. Emotions flood her bloodstream: relief, amazement, gratitude – and a whole new nervousness. She did it. She beat out the younger, fresh-faced, idealistic, just-graduated twenty -somethings. It’s only a file clerk job, but it’s a start. It’s a paycheck. Her mind races over hygiene and wardrobe logistics. Shower at the gym. An outfit for each weekday at the thrift store. She should have just enough money. If she can keep anyone from finding out she’s homeless until she isn’t anymore, that will be the trick. Mists and guests swirl around schedules and deadlines, creating a cowboy two-step kind of dance at the ranch. A Congress has been declared, and new plans unfold. Thus work at the ranch continues. Beginning July 10, Carrot Ranch will raise a barn–in the form of a new page on this site–dedicated to the recently declared Congress of Carrot Ranch Rough Writers. From an idea born in the wild west–to wrangle weekly flash fiction from 99 words each week–a global lot has galloped in with saddlebags full of writing vim and vinegar. 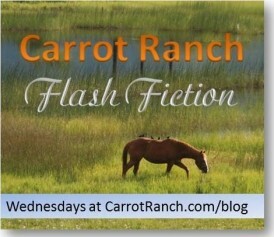 Think of the upcoming page as a dandified “blogs I follow” with special attention given to the unique contributions of each Rough Writer to Carrot Ranch Flash Fiction. Each writer will be introduced in sequential Thursday posts with insights to their writing process, influences and goals. Why do this? Well, I had hoped to create a “literary community” out of practicing flash fiction. Writing is like riding a horse–we ride/write alone. We imprint our ideas, imaginings, perspectives and sense of identity upon the page and our readers reflect back their own. Yet, often we don’t get to experience full literature (reading, writing, discoursing) because we are alone in what we do. Therefore, a literary community writes, reads and has discussions. It’s a group dynamic. Writers can trot through once in a full moon or saddle up weekly. It’s not the frequency; it’s the contribution. The Rough Writers have each exhibited the talent to write; the courtesy to read; and the intelligence to reflect, comment and discuss. This is how literature connects us. Flash fiction–as a weekly practice–does make one a better writer. I remember saddling up my horse in spring after a winter of not riding. I felt floppy in the saddle and sore after the first few rides. By the end of summer, my legs were strong, my reflexes quick and my sense of joy in riding was maximized. Practicing the craft of fiction regularly results in a stronger, quicker and joyful writer. June 18, 2014 prompt: In 99 words (no more, no less) write a story about getting stronger. What hard work or practice has paid off? Has the character, setting or story changed as a result? As you continue to write, may your writing get stronger. May your words fly! Respond by noon (PST) Tuesday, June 24 to be included in the compilation.